My Creative Time: Peachy Keen Challenge #38 & WINNER of PKS BLOG HOP! Peachy Keen Challenge #38 & WINNER of PKS BLOG HOP! "Fall is in full swing, and using the month of October an inspiration, create a layout or project based on the season and using PKS' stamps. The only catch is that it can NOT be a card! We will vote and pick one judged winner and we'll all vote for our top 5. PKS will send out badges to the bottom four, and the WINNER will receive a "Peachy" prize package!" So, with that said, the deadline for this challenge will be October 17th! So why don't you head on over to the Peachy Keen Challenge blog & link your project up to Mr. Linky for a chance to win! Now, for my layout I used the "Apple Cider" fall collection & the I-Rock from Imaginisce. Also, the stamps I used from Peachy Keen are "Pumpkin Face Parts" and the "Pumpkin Faces"! I hope you enjoy my video on how I designed my layout!! My daughter and I just watched your video. WE LOVED your scrapbook page. The pumkins are adorable. And I'm loving the paper too! Have a wonderful day Emma! I love how you doodled on your pumpkins!!!! I love it!!!!!! I saw yours and got inspired to create!! Congrats Sharon!! Emma, This LO is super cute!! This is such a lovely layout, Emma! The bright and fun colors are gorgeous, and those pumpkins with those adorable faces are priceless. I love the punched border, and the gem stones. Soooo cute!! Love the layout and that paper! So cute! I love everything about it! I love this page I love fall so many pretty colors to use. Thanks for sharing. What a super cute layout! I love it!! So cute, Emma! I love those little faces! Emma, that layout is adorable. Love the pumpkins. Emma, this is just too darn cute! I just love those pumpkin faces! congrats to the winter. Like always Emma I love it. CARD CHALLENGE AND GIVEAWAY ON CONTEST PAGE. Emma this is great! I love watching you use your "Gypsy Girl." I still can't get my George to load on my Gypsy. I would love to use it on my Gypsy. I love this page. It will look great with a picture of those two good looking boys of yours. Emma you make the cutest projects and this LO is adorable. TFS! Well, as usual, you knocked that ball right out of the park Sweety! Emma, this is the most adorable layout!!! Love, love, love it! Thank you so much for mentioning our site, CricutSearch.com, in your video! I will have to link to it from our YouTube page! Thanks for the tip for the search engine for cricut cuts. I will have to think of something for peachy keen's challenge. Love that paper, my polka dot friend! 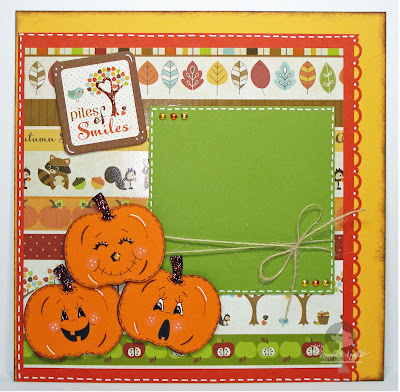 That card is sooooo cute, I love little pumpkins especially with these cute PeachyKeen Stamps faces! ADORABLE! i love this layout.. the faces are so perfect on your pumpkins! Amazing job like always!